There’s a new park in Pittsboro and it’s got some world-class features in the works. Rock Ridge Park has only been open since November 2012, but it already holds the key to a great time. Sitting on 52 acres, this facility is home to an 80 foot long zipline, a German pendulum swing, trails, and more. With tons of things to do outdoors, there’s sure to be something for everybody. As a Mom, I always appreciate clean places where I can take my daughter to play. 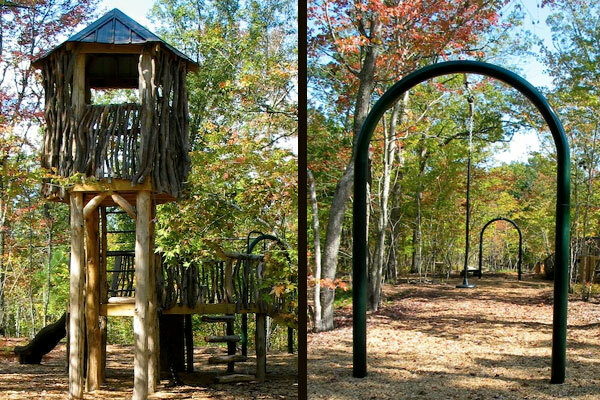 Kids don’t go outside enough these days, but Rock Ridge Park just might change that for our community. Parents can watch their kids play in a fort tower made from Locust and Rhododendron wood–which alone makes this park really cool–and take the opportunity to learn about the uniqueness of nature. Kids can have fun on the slide or bring out their creative sides as they explore the rest of the play equipment. Pause for lunch in a lovely picnic shelter protected from the rain so that you can enjoy each other’s company while dining in front of a picturesque backdrop of trees. Looking for somewhere beautiful to exercise? Runners and bikers can take advantage of scenic trails through the woods and look forward to off road bike trails to come. The park’s not done yet, so be on the lookout for things like disc golf, a dog park, a soccer field, and more trails. If you’re like me, it’s been a busy holiday season this year. Looking for a way to relax? Take a stroll through the woods and reflect on how peaceful nature is. The fresh air and birds chirping will do just the trick. Zip lining is the perfect mix of adventure and fun, and we’re lucky enough to have our very own zipline here in Pittsboro. Experience the outdoors in a new way as you sail alongside the trees. The line isn’t that high, so even those who are normally a bit timid when it comes to heights can give it a go. Who knows? Rock Ridge Park could be your new favorite spot to hang out. Photos from Pittsboro Parks Blog. 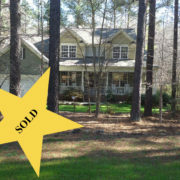 Country Living in Cary - SOLD!